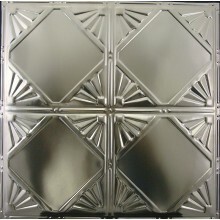 #101 Beveled Square Geometric Design - 12" Repeat ..
#102 Embossed Arcing Diamond & Floral Coin Des..
#103 Diamond & Floral Design - 6" Repeat Patte..
#103B Diamond & Floral Design - 6" Repeat Patt..
#104 Clover Design - Ideal for Center Piece - 24"R..
#105 Vintage Gothic Arabesque Flower Design - 12" ..
#106 Large Concentric Square Design with Textured ..
#107 Circular Wreath Design Embossed with Egg &..
#108 Oak Leaf & Half Circle Geometric Design -..
#109 Antique Look Victorian Flower & Ornate Me..
Pattern #110 Embossed Square & Floral Design w..
#111 Trellis & Scroll Design with Criss-Cross ..
#112 Lucky Clover & Thorns Design - 24" Repeat..
#113 Baroque Cross Design with 4 Geometric Quadran..
Metal Ceiling Tile Pattern #114, 24"&n..
#116 Camelot Design with a Hammered Metal Border -..
#118 Embossed Diamond Design with Embellishments I..
#119 Geometric Diamond Design - Ideal for Backspla..
#119B Geometric Diamond Design - Ideal for Backspl..
#120 Geometric Square Design Contemporary Look - 6..
#120B 18" x 24" Geometric Square Design Contempora..
#121 Northwest African Barbary Design - 6" Repeat ..
#121B 18" x 24" Northwest African Barbary Design -..
#122 Victorian Design with a Hammered Metal Fill a..
#123 Unique Floral Emblem Centerpiece Design - 24"..
#124 Four Oval Flower Design with Geometric Bevele..
#126 Large Circular Roman-Inspired Ornate Medallio..
#127 Parsian Floral Design - 6" Repeat Pattern ..
#128 Large Square with Beveled Edges and Hammered ..
#129 Arisian Medallion - 24" Repeat Pattern 100..
#130 Floral Elements and an Arched Borders in Geom..
#130B 18" x 24" Floral Elements and an Arched Bord..
#131 Contemporary X Design with a Textured Fill - ..
#131B 18" x 24" Contemporary X Design with a Textu..
#134 Four Leaf Clover Medieval Design with Texture..
#135 Small Four Leaf Clover Medieval Design - 6" R..
#136 Ornate Floral Edged Square Design with Hammer..
#137 Gothic Prominence - 6" Repeat Pattern 100%..
Blank Unstamped - Flat 24" Tin Plated Sheet metal ..
#Brick Metal Ceiling Tile Filler can be used for E..
Diamond Design Finish - 24" Repeat Pattern..
#MF1 Bumpy Hammered Filler can be used for Edges &..
#MF2 Diamond & Criss-Cross Design can be used ..
Pattern #MF3 Filler Tile 11x27 “All patterns ca..
24in X 24 in tin ceiling tiles are available in over 40 distinct patterns. 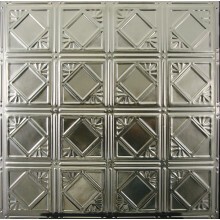 Each pattern can be ordered in any of over 30 colors and hand faux finishes. 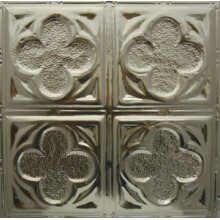 Our tiles can also be ordered unfinished and are ready to be painted or finished when obtained unfinished. 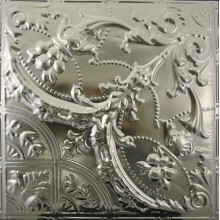 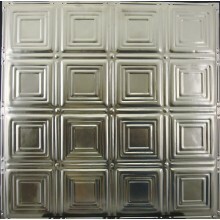 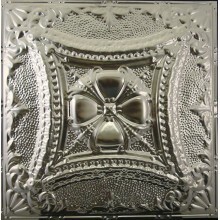 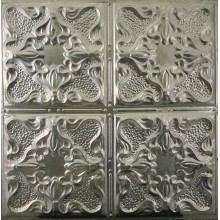 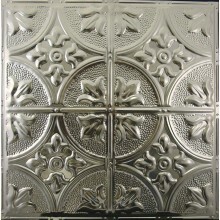 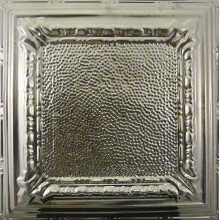 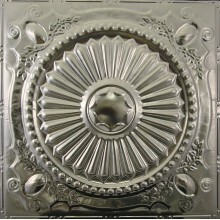 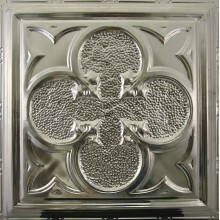 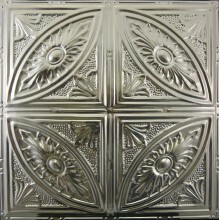 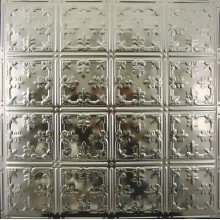 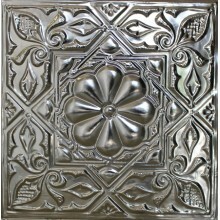 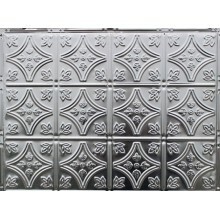 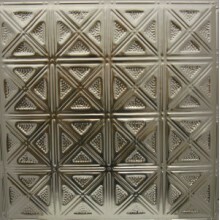 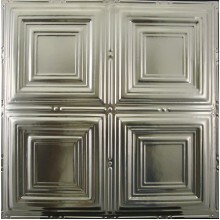 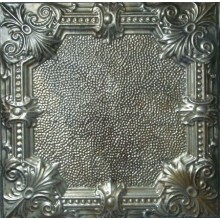 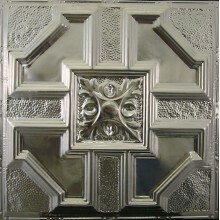 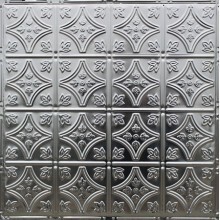 We have a very large selection of tin tile patterns that will be sure to suit every possible installation need. 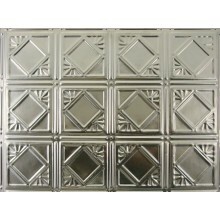 Go ahead and browse our colors and patterns and do reach out to us with questions. 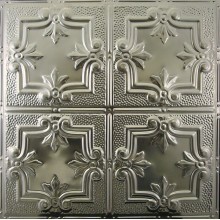 Each pattern is also available in hand-faux finish to achieve an authentic vintage or antique look and feel. 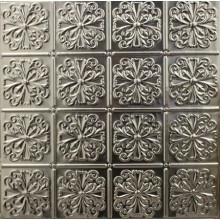 Check out our Artisan series of hand faux finished metal tiles to get an idea of the authentic vintage or antique look and feel. 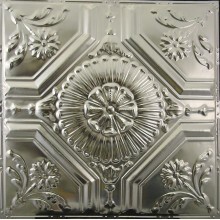 Additional items include matching molding, edging, switch plate covers and matching nails so you get everything you need to complete your tin ceiling or backsplash project to your complete satisfaction. 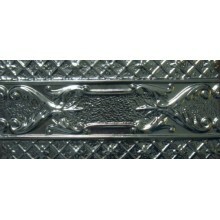 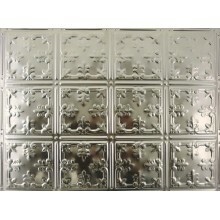 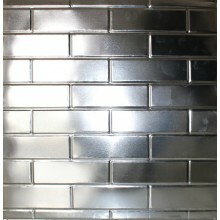 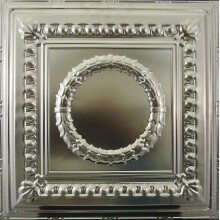 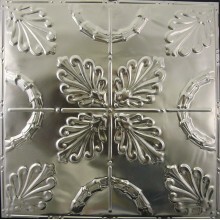 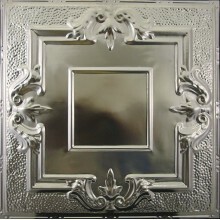 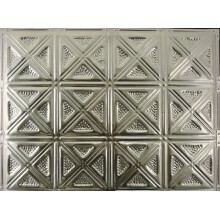 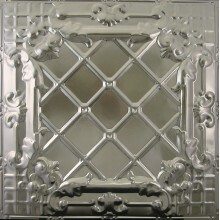 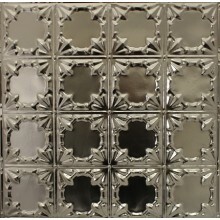 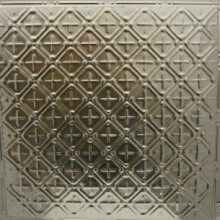 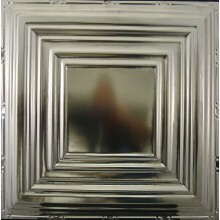 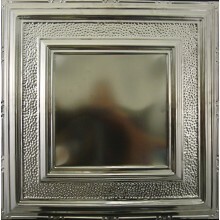 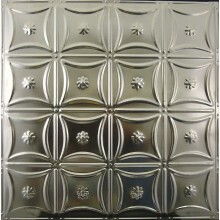 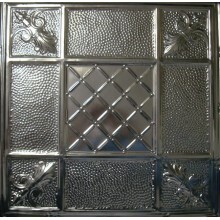 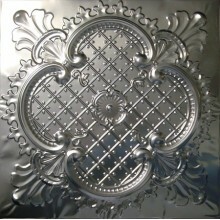 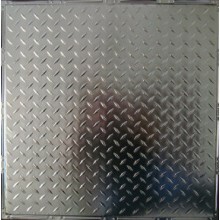 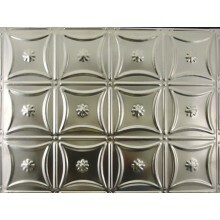 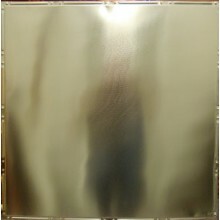 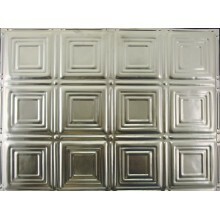 12in nail-up backsplash metal tiles and 18 x 24 backsplash tiles are available unfinished in 14 patterns. 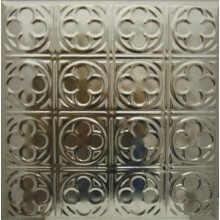 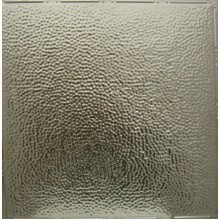 You can also order only 12in nail-up solid copper hand faux tiles that will create a stellar backsplash of your choice.